Beginning Sept. 23, firefighters from seven agencies across the state will be conducting prescribed burns across hundreds of acres to improve forest health in Central Washington. Unlike the large wildfires burning across the West this summer, these are intentionally set fires designed to protect communities and restore forests. The agencies’ goals are to learn and train in the use of prescribed fire through a formal training exchange (TREX). Sponsored by the Fire Learning Network, TREX is a unique opportunity for fire personnel from across the region to learn about prescribed fire and forest health across traditional agency boundaries. Jordan Tsubota , on a controlled burn on McCartney Creek preserve as part of Cascadia TREX Oct. 5 2017. Photo by Chris Brandon. Shared stewardship of our forests requires increasing coordination and training across fire and forest-management entities. A primary goal of the TREX training exchange is to increase local capacity, knowledge and skills for prescribed fires by providing fire training and creating new relationships and trust among participating groups. Chris Martin, property owner of forest that was burned, Roslyn firefighter, owner of Basecamp Books in Roslyn, Cascadia TREX Oct 5 2017. Photo by John Marshall. 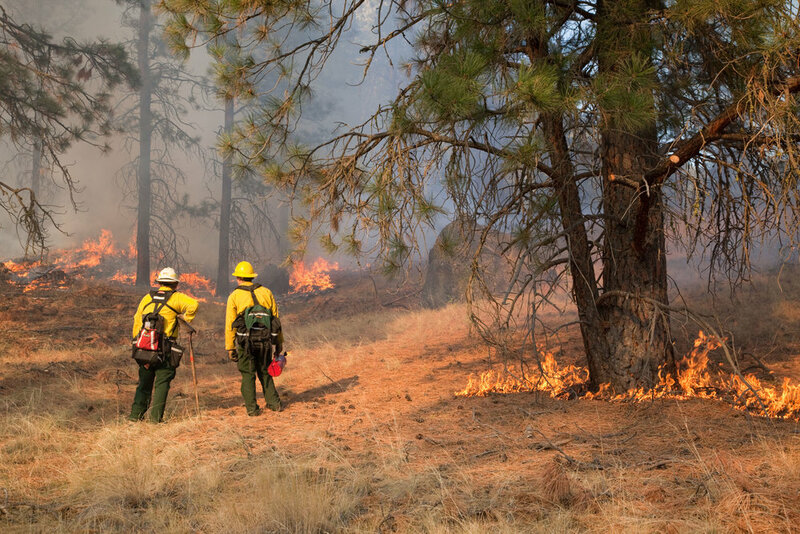 For firefighters, TREX is a collaborative environment designed to enhance the sharing of experience and learning across agencies as well as seeing first-hand how low- to moderate-intensity fire can restore forests and create safer conditions for communities. Prescribed fire in ponderosa pine forest in fall on Sinlahekin Wildlife Area in Okanogan County. Prescribed fire plans for the greater Cle Elum area TREX include approximately 500 acres on the Okanogan-Wenatchee National Forest near Cle Elum, 250 acres on lands managed by the Washington Department of Fish & Wildlife in Yakima and Kittitas Counties, 85 acres in the Central Cascades Forest managed by the Nature Conservancy, and 95 acres of private lands near Roslyn. TREX burns could occur Monday Sept. 24 through Friday Oct. 5. Training participants are from the Washington Department of Natural Resources, USDA Forest Service, Bureau of Land Management, Roslyn Fire Department, Kittitas County Fire District 1, National Park Service, and the British Columbia Wildfire Service. The training is hosted by the Washington Prescribed Fire Council, the Washington Resource Conservation & Development Council, The Nature Conservancy, USDA Forest Service, Washington Department of Natural Resources, Washington Department of Fish & Wildlife and the Fire Learning Network.